This time last year on World Book Day 2015 we launched our Let Books Be Books campaign asking publishers to take the ‘boys’ and ‘girls’ labels off books and allow children to choose their interests for themselves. Since then, eight publishers have committed to publishing no more gender-labelled titles, and perhaps more importantly, we’ve contributed to a growing discussion in the publishing industry about the ways books can be packaged and marketed to appeal to boys or girls. 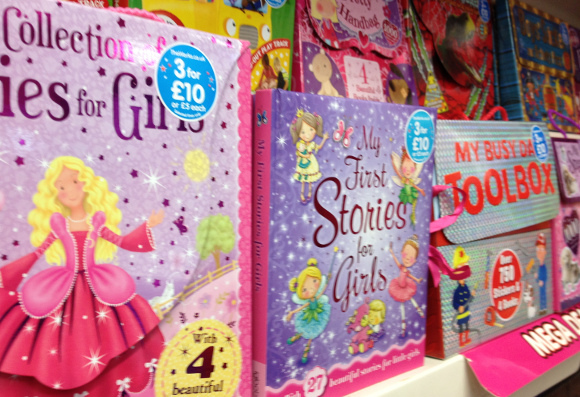 We believe that gender simply isn’t a good guide to a child’s interests; choosing books according to tired stereotypes about girls and boys limits children’s choices, reinforces negative ideas about boys which are particularly harmful, and means children missing out on stories and characters they may love. I have done a lot of work in my role with libraries trying to encourage reading that is not seen as ‘gendered’. I was the youngest child of four (I’ve got one brother and two sisters), so as a child I read all of ‘Malory Towers’, lots of Dorothy Edwards ‘My Naughty Little Sister’, Judy Blume etc. I do think that breadth of reading as a child was quite formative and has led to me reading very widely now. Is there a book you loved, but you felt embarrassed to be seen reading? Was there a book that helped you, or meant a lot to you and someone suggested it was ‘a girls’ book’ or ‘for boys’? Do you know a boy reader who’s been hooked by Malory Towers, or the Rainbow Fairies, or a girl who loves adventure or spy stories?